Why Did My Recruiter Ask Where Else I’m Interviewing? The great thing about being a recruiter is that your friends call you for advice on working with other recruiters, or negotiating job offers, or interview etiquette. Recently, a friend called to tell me that she received an offer through a recruiter for a position she wanted, but that she was also in the interview process with another company that she wanted to see through. The first thing I told her was that her recruiter must not be that good if she didn’t ask her what other interviews she had going on. This is where things got interesting. “Well, she did ask me where else I’m interviewing, and I told her I wasn’t. Why is it even her business to know where or if I’m interviewing”, my friend exclaimed. Now things were becoming clear, this was a good recruiter and an untrusting candidate. And yes – I understand why job seekers are untrusting. They apply for jobs, and even interview for jobs, and then never hear back. There’s a lot of work that the recruiting and HR industry needs to do to gain trust back, for sure. So, I explained to my friend, the reason we ask if you have other interviews going on is so that we can help you consider all of your options. If you have another interview going on, I would ask what stage of the process you’re in and how you feel about that job, and if offered the position with my client, would you be ready to stop interviewing with the other company or would you want to see it through? Your answers to these questions help me to guide the client in a direction that will keep everyone happy. For instance, we might move interview dates to accommodate timing, or to hold off on making an offer so that they don’t get frustrated when the offer is out for too long and end up believing that you have lost interest, or have poor decision-making skills. It’s no secret that companies are interviewing more than one person for a job, so why should we feel the need to hide the fact that we’re also keeping options open? What happens if you don’t have a recruiter friend? 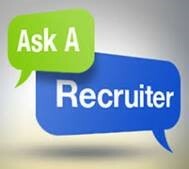 Just ask your recruiter “I’m curious, why are you asking me this and what will you do with the information?” or, Call me! Really, I don’t mind talking about why we do what we do – and it might be a good chance for us to understand each other more. For this series we’d love to hear from you, if there something you’ve been asked by a recruiter, HR person, or even a hiring manager that maybe we can help shed light on? Why Should I Call My Recruiter After My Interview? In over 25 years of placing the right professionals in the right jobs, Germer International has earned the trust of hundreds of Pharmaceutical, Biotech, and Medical Device companies, attracting the best qualified candidates.